For over 2000 years, yoga practitioners have sworn by the inherent mental and physical benefits of regular use. Whether you’re dipping your toe into the yoga hot pool for the first time or know the different between barre (a combination of ballet, yoga, and Pilates) and hatha (yoga with a focus on physicality and breathing control), the following 10 Virginia studios have instructors ready and willing to bend your mind, body, and soul. Northern Virginia Magazine voted Spark Yoga as the “Best Yoga Studio” last year. Central to Spark Yoga’s philosophy is the idea of exercising in a “safe space with the highest quality air standards.” To that end, each Spark Yoga building uses as much green construction materials as possible and the highest quality air filtration. Spark Yoga offers training in yoga, barre, aerial, circuit, and meditation and hosts regular events, such as yoga in the park. The owners of Hot Yoga Studio in Virginia Beach have paid special attention to the design of the space, intending to create an “intimate, Zen-like space with bamboo and slate flooring and six-foot tall mirrors.” The result is an intimate hot yoga meditation studio that specializes in hot yoga, hot flow, warm flow, and yin style workouts. Check the website for regularly updated workshops and training opportunities. FlyDog Yoga in Charlottesville, Virginia, offers a full course catalogue suitable for practitioners of all levels. FlyDog specializes in Power Vinyasa yoga, a style that focuses on fluid movements and controlled breathing in a heated studio. Aerial yoga classes allow new and old students to learn yoga poses while airborne in a hammock. Events include outdoor yoga overlooking mountains and on incredible vineyard properties. Dream Yoga Studio and Wellness Center began over 15 years ago with six students and has grown into one of the most well respected studios in Northern Virginia. The classes are suitable for all ages and experience levels. Styles include Hatha Yoga and Kripalu Yoga, that “teaches the basic mechanics of yoga postures and breathing.” Mindfulness, meditation, rejuvenation, and strength are all part of the Dream experience. Pure Prana in Alexandria, Virginia, offers a diverse range of yoga classes and styles, with over 60 classes per week. Styles include power hour, 50+ yoga, hatha, Vinyasa, prenatal, Yin, restorative meditation, and Pilates, with the option for personalized appointments with even more variations available. For fewer than $100, members have access to unlimited classes. Zenya is a solid yoga studio with great fundamentals and a knowledgeable team. By offering beginner and intermediate level classes in multiple disciplines, Zenya is sure to have a class for you. Prenatal yoga classes are also offered. Sign up for a free week trial or consider becoming a student to eventually teach your own yoga classes. 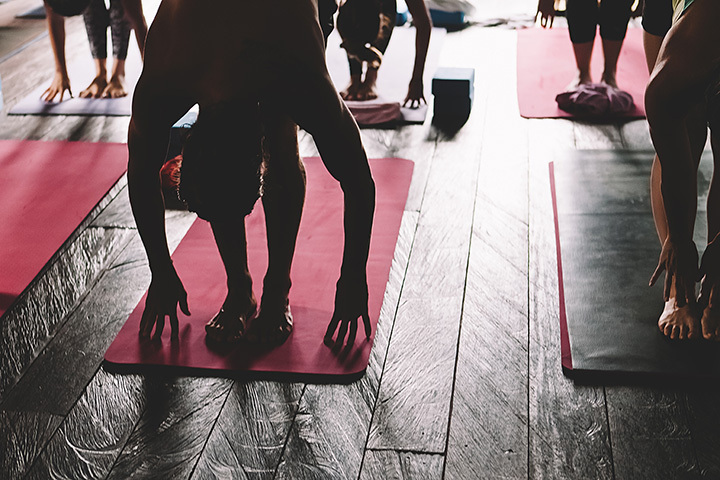 Dragonfly Yoga Studio doesn’t just want to provide incredible yoga classes—the Dragonfly team wants to become an invaluable and important member of the Fredericksburg community. To that end, Dragonfly sponsors regular community events, including family yoga, sound healing, and dog adoption-themed retreats. In addition, Dragonfly offers classes for beginners, intermediate, power yoga, hot, yoga, barre, chair yoga, and prenatal yoga, among others, for an all-around excellent studio experience. Yoga Nook is an intimate studio in Chesapeake, Virginia, that hopes to become a community environment as well as the go-to yoga studio in the area. Foundational classes, community restorative, yin and yang, chair yoga, and guided meditation are just some of the many different class options available. Events include acro skills and conditioning, Thai massage, and inversion workshops. Studio South in Williamsburg, Virginia, combines southern hospitality with traditional yoga training to create unique twists on the age-old yoga tradition. Studio South offers hot yoga and a custom method of Barre, called BARRE Philosophy that “fuses strength training techniques from ballet with Pilates and yoga.” No experience is necessary to get started at the studio. Check their website often for new workshops and events, including yoga by the Chickahominy River, fundamentals classes, and more.